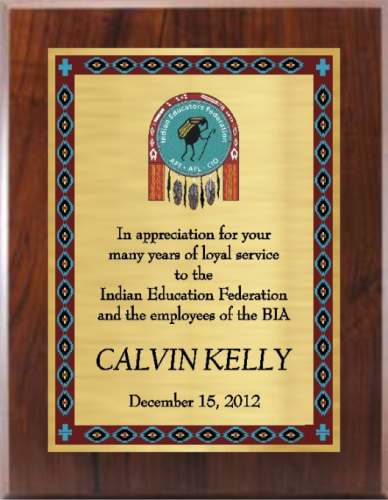 Our Gold Series Native Heritage Plaque combines a gold background plate with rich turquoise and maroon Native American designs, mounted on a simulated walnut plaque board. Includes your custom logo. Gold Series Native Heritage Plaque 5" x 7"
Gold Series Native Heritage Plaque 6" x 8"
Gold Series Native Heritage Plaque 7" x 9"